This picture shows an unusual scepter quartz crystal projecting from an etched golden beryl. Although not visible in this picture, the very tip is amythestine. The crystal is 5cm long. All of these pieces were removed from the Golden Beryl Pocket July 2,1999 at the Orchard Pit, Buckfield, Maine. In the background is a nice terminated golden beryl. 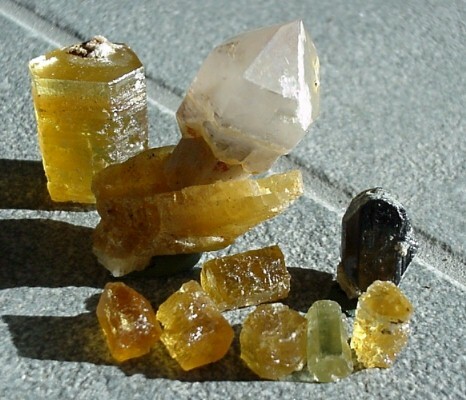 The black crystal at the right is a columbite/tantalite series crystal. There were over 200 crystals removed from this pocket.